Custom Tile Installation in San Diego, La Jolla, Del Mar, Encinitas, La Costa, Carlsbad, Poway, Escondido, Alpine, Chula Vista, and places in between, by a licensed tile contractor and professional installers. Installation of marble tile mosaic and Calcutta Marble tile Backsplash. With Calcutta Marble Countertops for a kitchen remodel in San Diego. Custom Tile Installation Contractor servicing San Diego, North East & South County and coastal towns. 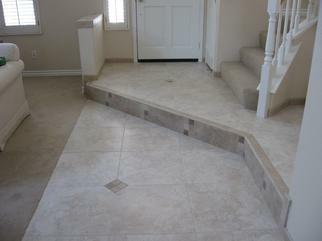 Professional Installation & Sealing of Chiseled Edge Versailles Pattern Travertile Tile Flooring in San Diego Poway area. Expert Tile Installation Contractor for custom Stained ArtO Concrete Pavers & Pool Tile Installation in San Diego Carlsbad area. 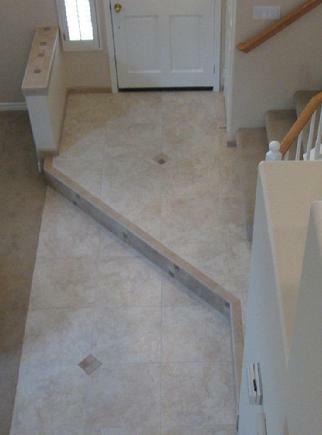 Installation of deco & Versailles Pattern for Tiles Pool Coping Stair Treads by a licensed tile contractor servicing San Diego areas Carlsbad La Costa La Jolla Chula Vista Alpine Del Mar Rancho Bernardo Poway Rancho Santa Fe Scripps Rancho Escondido Fallbrook Bonsall Valley Center. Professional Installation of 18 INCH HONED TRAVERTINE BATHROOM TILE BY LICENSED TILE CONTRACTOR FOR THE SHOWER WALLS AND FLOOR IN SAN DIGEO. We mud float all tile substrates for shower walls making for a longer lasting tile installation. INSTALLATION OF 18 INCH TRAVERTINE TILE FOR THE FLOOR AND COLONIAL CREAM GRANITE COUNTERTOP. AFTER THE INSTALLATION OF THE MULTI COLORED & MULTI PATTERNED SPLIT BRICKS AND WE REMOVED THE WHITE STAINS FROM THE ADOBE BRICK WALL CAUSED BY WATER DAMAGE, EFFLORESCENCE, & CALCIUM BUILD UP FOR A PATIO IN SAN DIEGO. PHOTO of CARRERA MARBLE TILE BATHROOM WAINSCOAT & BASKETWEAVE TILE FLOOR & STAINED 12 INCH MEXICAN SALTILLO PAVERS FOR THE HALLWAY FLOORING ON A DIAGONAL. Expert Installation of BASKETWEAVE CARRARA MARBLE FLOOR TILE & 3 x 6 INCH SUBWAY MARBLE TILES FOR THE WAINSCOAT FOR A BATHROOM REMODEL IN SAN DIEGO RANCHO BERNARDO CA area. And installing electric radiant heated mats & cables under the tile floor for a warm & comfortable feel during the colder days & nights. Beautiful Installation of Tumbled Crema Marfil Marble Tiles for the shower walls & bench seat area in San Diego. And installing of a steam unit & shower. INSTALLATION OF HEXAGONAL LINCOLN PAVERS & CANTERA STONE FOUNTAIN FOR A PATIO REMODEL IN SAN DIEGO ESCONDIDO AREA & 4 INCH SQUARE TERRA COTTA TILE BORDER PHOTO. Proper Installation of Lincoln Pavers & Terra Cotta Clay Tiles involes sealing the tiles with a high quality sealer making sure the slope to the drains in correct to prevent water puddles and damage. INSTALLATION & SEALING CUSTOM LIMESTONE & TRAVERTINE PEBBLE TILE MOSAIC FLOOR IN SAN DIEGO SOLANA BEACH AREA. WE INSTALLED THE ECO SILESTONE COUNTERTOPS AS WELL AS THE SUBWAY PATTERN FOR THE BACK WALLS WITH AN ACAI BRICK LINER. AND THEY ALSO USED RECLAIMED ACACIA WOOD FOR THE SKIRTING OF THE COUNTERS AND WALLS. PICTURE OF OCTAGONAL MEXICAN SALTILLO TILES FOR KITCHEN FLOORING & INSTALLATION OF CARRARA MARBLE & SOAPSTONE COUNTERTOP IN SAN DIEGO. With 3 x 6 inch limestone tiles, decorative talavera tiles, & moldings installed for the backsplash area. WE ALSO DO FABRICATION & INSTALLATION OF ONE PIECE FULL SLAB MARBLE, GRANITE, LIMESTONE, TRAVERTINE, & ONYX SHOWER PANS & TRAYS. WE GRIND DOWN & SCULPT THE NATURAL STONE SO THERE IS A PERFECT PITCH THE DRAIN FOR PROPER DRAINAGE. THE GRINDING PROCESS ALSO REMOVES THE POLISHED FINISH OF THE STONE FOR A NATURAL TEXTURE. WE ALSO DRILL A PERFECT 4 INCH HOLE FOR THE DRAIN CUTOUT FOR A CLEAN FINISH. THE ONE PIECE STONE SHOWER PANS ARE MORE WATER TIGHT & EASIER TO CLEAN THAN STANDARD STONE TILE & GROUT SHOWER PANS. INSTALLATION IS IN THE NEXT PICTURE. INSTALLATION OF SHOWER TILE WITH EMERADOR DARK HONED MARBLE LINERS AND LISTEL. AND THE INSTALLATION OF SHOWER DOOR. AS WELL AS CLEAN LOOKING POLISHED SQUARE DRAIN. INSTALLATION OF TILE WAINSCOAT, PEDESTAL SINK, AND CHROME MIRROR AND MEDICINE CABINET. INSTALLATION PHOTO OF 18 INCH DURANGO TRAVERTINE TILE FLOOR ON A DIAGONAL WITH EMPERADOR DARK MARBLE MOSAIC TILES OUTLING THE TRAVERTINE & MAHONGANY HARDWOOD BORDER FOR ENTRY. BEAUTIFUL CUSTOM STAINING, INSTALLATION, AND SEALING OF MEXICAN SALTILLO TILES FOR AN OUTDOOR PATIO IN SAN DIEGO. We also formed and installed the precast concrete bench caps for the seating area. WE WORKED REALLY HARD ON THIS PROJECT. WE MADE SURE TO DO OUR BEST TO MAKE ALL OF THE TILES LOOK LIKE IT WAS A FLOWING PATTERN. AND WE WENT THRU ALL OF THE TILES TO PICK OUT THE DARKER TILES WHICH YOU SEE IN THE NEXT 2 PICTURES FROM THE LIGHTER TILES WHICH YOU SEE IN THE GUEST BATHROOM. IF WE WOULD HAVE MIXED THEM LIKE THEY WERE DELIVERED IT WOULD HAVE COME OUT REALLY SPLATTERED. ONCE AGAIN NOTICE HOW ALL OF THE SHADES FLOW TOGETHER FOR A RELAXING FEELING. INSTEAD OF ALL CHOPPED UP WITH ALL SORTS OF DIFFERENT TILES SCATTERED THROUGHOUT. THATS OK WITH MOST STONE INSTALLATIONS. YOU ACTUALLY WANT TO DO THAT. BUT NOT WITH VEIN CUT NATURAL STONES. AND THE SHOWER INSTALLATION FOR THE COMPLETE BATHROOM REMODEL. THIS IS THE GUEST BATHROOM INSTALLED FROM THE SAME BATCH OF VEIN CUT SILVER BEIGE LIMESTONE. BUT THESE ARE MORE OF THE WHITE AND GREY PIECES OF STONE FOR A COMPLETELY DIFFERENT MORE FLOWING TILE INSTALLATION. WE DID THE COMPLETE REMODELS FOR BOTH BATHROOMS. 12 INCH OCTAGONAL MEXICAN SALTILLO PAVER TILES WITH A SEMI HIGH GLOSS FINISH. INSTALLATION OF A LINEAR SHOWER TRENCH DRAIN. FOR AN EASY ACCESS AND MODERN LOOKING SHOWER PAN INSTALL. DUE TO STRUCTURAL ISSUES WITH THE EXISTING FRAMING IT WASN'T POSSIBLE TO PUT THE DRAIN ABUTTING THE BACK WALL WHICH DOES GIVE A MORE BEAUTIFUL FLOWING APPEARANCE TO THE FLOOR TILE INSTALLATION. PHOTO IMAGE PICTURES. I AM WAITING ON THE FRAMELESS GLASS DOOR TO BE FABRICATED AND IT WILL SIT JUST INSIDE THE VERTICAL TRAVERTINE MOLDING. DESIGN FOR A DESERT HOUSE AND MASONRY. PHOTO IMAGE OF A QUARTZITE TILE MOSAIC SHOWERPAN & PICTURE OF YELLOW LIMESTONE SHOWER WALLS. NOTICE HOW THE LIGHT AND DARK SHADED TILES ARE EVENLY MIXED IN TO GIVE A FREE FLOWING FEELING. IVE SEEN SOME TILE INSTALLATIONS THAT HAVE BIG PATCHES OF LIGHT AND DARK TILES AND THAT JUST KILLS THE WHOLE INSTALL IN MY OPINION. 18 INCH POLISHED CREMA MARFIL MARBLE INSTALLED ON A DIAGONAL WITH TIGHT GROUT JOINTS SO YOU CAN FOCUS MORE ON THE BEAUTY OF THE NATURAL STONE. PICTURE OF GRANITE COUNTERTOP AND TRAVERTINE BASKET WEAVE BACKSPLASH TILE INSTALL. PICTURE OF A FULL SLAB LIMESTONE SHOWRPAN READY FOR THE INSTALLATION. NEXT PICTURE. PICTURE OF FULL SLAB ONE PIECE LIMESTONE SHOWER PAN THAT WAS LIGHTLY SANDBLASTED FOR ADDED TEXTURE. AND WE INCISED GEOMETRIC CHANNELS IN THE STONE THAT HAVE A PERFECT PITCH TO A PERFECTLY CUT OUT DRAIN. THE INCISED LINES ADD A DESIGN ELEMENT AS WELL AS ADDITIONAL GRIP. THE FULL SLAB SHOWERPANS ARE MORE WATER RESISTANT THAN COMMON TILE AND GROUT SHOWERPANS AND EASIER TO MAINTAIN. AND THE FACT THAT WE GRIND THE STONE DOWN SO IT HAS A PERFECT PITCH TO THE DRAIN MEANS NO MORE STANDING WATER AND DIRTY, CRACKED, AND LEAKING GROUT JOINTS WHICH PROMOTE THE GROWTH OF MOLD, ETC. AROUND THE PERIMETER OF THE SHOWERPAN. AND ITS NICE TO STAND ON A FULL PIECE OF STONE AND WITNESS THE BEAUTY OF NATURE. AND PICTURES OF 18 INCH POLISHED LIMESTONE FOR THE WALLS. WE INSTALLED A BEACH PEBBLE WAVE PATTERN TO TIE IN WITH THE FLOOR TILE. AND THE INSTALLATION OF AN OVERHEAD SHOWERHEAD. AND A BROWN LEATHERY WATER RESISTANT WALLPAPER FOR BEAUTY AND PROTECTION. THE NEXT FEW PICTURES ARE OF A BATHROOM REMODEL WITH RED AND WHITE MARBLE AND GLASS TILE. WE CUT DOWN THE 12 INCH RED MARBLE FROM THE FLOOR TO 4 INCH PIECES FOR THE SHOWRPAN TO ALLOW FOR THE PITCH TO THE DRAIN. PICTURES OF KITCHEN OCEANSIDE TILE BACKSPLASH INSTALLATION. AND BLACK ABSOLUTE GRANITE COUNTERTOPS. Iridescent Oceanside Glass Tiles offer everchanging reflections and colors.photos images. 1 INCH IRRIDESCENT OCEANSIDE GLASS TILE INSTALLATION WITH ABSOLUTE BLACK GRANITE COUNTERTOPS. INSTALLATION PICTURE OF BISAZZA GLASS TILE AND WOOD MANTEL FOR A CLEAN AND MODERN LOOKING FIREPLACE. photo images. INSTALLATION OF SALTILLO TILE PATTERN WITH SAN FELIPE & FLEUR DE LYS PATTERNS. PHOTO OF SHOWER & BATHROOM REMODEL & THE INSTALLATIO OF POLISHED CREMA MARFIL MARBLE FOR SHOWER WALLS, SHOWER PAN, & CEILING IN POWAY CA. FABRICATION & INSTALLATION OF AZUL BAHIA GRANITE COUNTERTOPS WITH A SATIN LEATHER FINISH FOR THE FINISHING OF BARBEQUE ISLAND INSTALLATION. Travertine Mosaic Tiles for the shower pan and curb. Notice the precise cuts around the drain. And the caulking around the perimeter of the shower pan to prevent any cracking of the grout and future mold and water damage. Most tile contractors don't even use caulking much less know how to do it right. BEAUTIFUL PHOTO OF 16 INCH WHITEWASHED SALTILLO TILE FLOOR. INSTALLATION, STAINING, & SEALING MEXICAN SALTILLO TILES & PAVERS IN SAN DIEGO CA. TUMBLED 6 INCH NOCE TRAVERTINE AND CAMARGO TRAVERTINE FOR SHOWER WALLS & CEILING. 18 INCH SLATE TILE INSTALLATION FOR OUTDOOR PATIO AND WALKWAY IN SAN DIEGO. photo images. Installation of Terra Cotta tiles. Joseph Bellows Photo Gallery at the Rancho Santa Fe Historical Society. Installation of glass tile. We used Star Quartz epoxy grout to match the copper accents of the tiles. Installation of reinforced concrete block and plywood tops for Barbeque. We scratch coat the concrete block for flagstone application. And mud float the concrete block for the application of the stacked stone. Installation of flagstone and stacked stone as the finish material over the concrete block for a backyard Barbeque. We also hooked up the gas lines and custom made and stained the doors. DRAWING FOR A DECORATIVE CONCRETE BLOCK HOUSE. IT SEEMS LIKE IT WOULD BE SIMILAR TO TILE WORK. chain link fencing pulled at different angles and heights to give a warped effect. Maybe add some more plants for shade and beauty wih brick walls for partitions. solar panels to emphasize height and depth. And I think 30 randomly placed 1 square foot windows looking out on the desert would look like a desert mosaic with the different heights and depths trying pull all of the images together. A HOUSE IN AN URBAN CHICAGO SETTING ON A STREET CORNER.